This past Thanksgiving weekend saw many families out shopping for Christmas trees, wreathes, and mistletoe while also taking advantage of Black Friday deals on holiday decorations, candles, and poinsettias. Once the holidays arrive in a few weeks, we’ll also be preparing our favorite holiday foods, maybe with a roaring fire inside while (hopefully) admiring the glistening blanket of snow outside. While all of this festiveness is welcome and highly anticipated, holiday prep can introduce unwelcome allergies into our households triggering sneezing, coughing, nasal congestion, rashes, itchy/teary red eyes, eye bags, and runny noses. But, it doesn’t have to be this way. Learn what you can do to have an allergy-free holiday season. If the Christmas tree is cut well in advance of being sold and is kept in a humid environment it can promote spore and mold growth. The Christmas Tree Association1 says that Christmas trees can carry as many as 50 different types of mold, all of which can cause allergies. Once a Christmas tree enters the house, the number of mold spores can multiply by five to six times and will continue to grow as long as the tree remains in the house. Christmas trees smell great because they contain substances called terpenes. Some people are allergic to terpenes if smelled or touched. Christmas trees may have pollen stuck to the branches and pine needles which then are released into your household when brought inside. If stored improperly for the year, artificial Christmas trees may be covered in dust and mold. The branches may contain bugs, mouse droppings and other types of debris. The chemicals used to manufacture the tree may cause allergic reactions. If the tree has been flocked for decorative affect, the chemicals used to create the flocking can be an additional source of allergies. Have someone without tree allergies shake the Christmas tree to remove any additional pollen, dust or dirt that may cling to the branches – at the tree farm/store and just before entry into your home. Use a vacuum or a leaf blower to remove extra dust and dirt. Wash artificial trees in a light solution of water and bleach to remove any spores and mold. Live trees can be washed down outside using a garden hose. Let them dry before bringing them inside. When the holidays are over, store an artificial tree in a plastic bag or plastic tub. Don’t store it is a porous cardboard box that will invite mold and mildew to grow on the tree. Wash/clean the tree skirt, tree stand, and all ornaments. Place your Christmas tree away from air currents which can distribute tree allergens throughout the home. Keep mold and mildew from your live tree by spraying it with a mixture of vinegar, cinnamon oil (or clove/peppermint oil) , and an oil that is citrus-scented (lemongrass/sweet orange). Buy a fir Christmas tree, not a pine. Firs appear to be less problematic for people with allergies. If possible, choose a concolor fir. It’s citrus-scented and also less allergenic. Can holiday decorations cause allergies? Short answer: it depends on where they have been stored. If they have been stored in a damp or dusty environment for up to a year, they can contain the same mold and dust that artificial Christmas trees do. You can help to prevent allergies when you open the Christmas decoration box by wiping the box down before opening it. Then wipe down each Christmas decoration as you take it out of the box. If decorations smell moldy they should be thrown out. When you repack decorations, wipe them down again so that any pollen or mold spores from the tree do not enter the box. Tape the box shut, wrap it in cellophane, or enclose it in a tightly tied garbage bag. Store the decorations in a dry location. 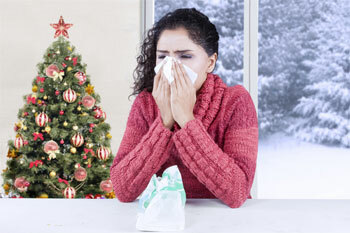 Like all plants, Christmas plants can cause their share of allergies. They can be especially hazardous for infants, toddlers and pets. One of the most common Christmas plants is the poinsettia. Because poinsettias are members of the rubber tree family, people allergic to latex are often allergic to them, as well. Breathing allergens from poinsettias can cause respiratory distress and touching them can cause rashes. If an infant or toddler does put the leaves or berries of these plants into his or her mouth, take the material out of the child’s mouth and then wipe the child’s hands and face with a damp cloth. Call the poison control center immediately. It’s important to note3 that poinsettias are not believed to cause death if ingested. The belief that it can be fatal comes from the story of a child who was poisoned after eating a piece of a poinsettia in Hawaii in 1919. The child ate from a wild plant that according to experts “bore little resemblance” to the commercially produced poinsettias available today. Holiday decorations often include candles, scented pine cones, infusers and sprays that make the house smell like the holidays. People can have different allergies to scents depending on the compounds used to create them. Scents can trigger/exacerbate allergies and cause congestion in the nose and chest. Fires in the fireplace can make the house seem more festive (and warm). However, smoke from the fireplace may enter the house instead of escaping through the flue causing allergic rhinitis or asthma symptoms. If many different house guests are going to be present for the holidays, one of the best ways to introduce scents into the house is to use potpourri or cinnamon sticks and cloves. If any of your guests are asthmatic it’s best to forego fires altogether. Inform your guests ahead of time of the menu items you plan to prepare. Offering several options for appetizers, entrees and desserts can help to ensure that your guests enjoy themselves while adhering to any dietary restrictions they may have. Holiday cocktails include special ingredients that may be used only once or twice a year. These special concoctions can include dairy, egg whites and dairy-based liqueurs. Some people are allergic to the sulfites found in dried fruit, maraschino cherries and red wine. If you are having cocktails, it’s a good idea to have a recipe that does not include dairy or eggs so all of your guests can sip one if they like. Can you be allergic to snow? That may seem like a funny question, but some people begin to experience allergic reactions when it begins to snow. Most likely it is a cold allergy that is also called cold urticaria. It causes itching, swelling and hives when the cold causes the body to release histamines. Over-the-counter antihistamines usually treat the symptoms well (as does staying out of the cold). Don’t let allergies get in the way of fully enjoying the holidays. Following these tips will help you avoid sneezing, coughing and runny noses while you enjoy the celebrations that lead us into the New Year. We wish you and your family happy holidays and a Happy New Year.